Also, Thailand may build an additional littoral patrol ship, a U.S. general angers China, and the PLA looks to space. 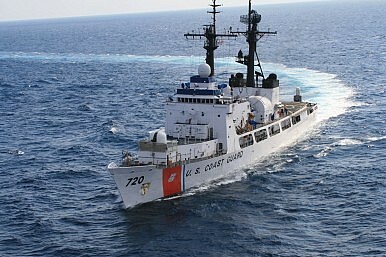 The Philippines is looking to purchase a third Hamilton-class high endurance cutter from the United States. “As far as we are now looking at it, there will be a positive action for getting a third Del Pilar frigate as we now call the Hamilton Class cutters,” Navy chief Vice Admiral Jose Luis Alano told Rappler. The decommissioned Hamilton-class frigates BRP Gregorio Del Pilar and BRP Ramon Alcaraz are among the Philippine Navy’s most capable warships today. The Philippines is expected to procure an additional warship to aid in its patrols of the South China Sea, where it attempts to protect its disputed territorial claims from China. Plans to acquire a third Hamilton-class frigate were reported to have been canceled as recently as September 2013. Thailand may be looking to build a second littoral patrol vessel soon under a license granted by BAE Systems. According to a Defense News report, “discussions are underway for construction of a second warship after a technology transfer deal between BAE and the state-owned shipyard Bangkok Dock resulted in the first of class, HTMS Krabi, being commissioned into the Royal Thai Navy in August 2013.” The ship is expected to be a smaller derivative of the Royal Navy River-class ship. In terms of features, the ship will sport a 76mm Oto Melara gun and a helicopter flight deck “able to operate a machine the size of the AgustaWestland A139 Lynx.” Thailand may consider the ship for export pending negotiations. In an article over at CSIS, Phuong Nguyen argues that the United States needs a more coordinated approach to the Lower Mekong region which could be the “next South China Sea.” The issue is part environmental, and part strategic. As Shannon Tiezzi detailed earlier, Japan’s decision to station a Ground Self-Defense Force contingent on Yonaguni Island — Japan’s westernmost inhabited island — has raised China’s ire. Finally, Zach and I discuss President Obama’s upcoming trip to Asia on the podcast this week. We also consider recent stabilizing developments in diplomacy between China and Japan, and Japan and South Korea. Plus, Russia-North Korea ties, a U.S. aircraft carrier switcheroo, Indian Ocean geopolitics, and more. Monday links. Everything to Read on the South China Sea Ruling and Its Strategic ImplicationsAfghanistan's NDS and Pakistan's ISI Give Cooperation Another TryA New Chinese Threat in the East China Sea? Not So FastChina Holds Air-and-Sea Exercise Near OkinawaOne Year of ADIZ: What Next for China?